Carol R. Lindsay M.A. has worked in the holistic health field since 1987. She is a graduate of The Institute for Therapeutic Touch (1987) and the Barbara Brennan School of Healing (1997). She has studied the medicine way with various First Nation teachers. She has also studied Native American, Celtic and Tibetan shamanic traditions. She also trained at the Women's Resource Center as a domestic violence counselor. 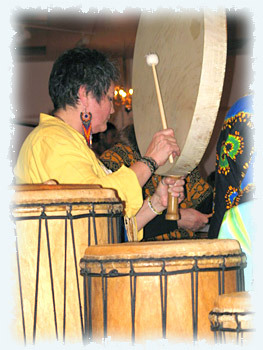 Carol has been a percussionist since 1968 and a teacher since 1972. She and two of her colleagues have formed the Surgery Support Team, providing energy healing before, during and after surgery. She weaves her various trainings and talents into creating a safe and sacred space for her clients in her private practice and offers workshops for self-care, self-discovery and fun.